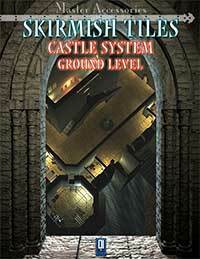 SKIRMISH TILES, Castle System is not a simple tile system. Obviously, you get a bunch of extremely cool tiles you can use alone or with other SKIRMISH TILES products, but there are a couple of things that take this product out of the ordinary. First, you can assemble the castle tiles in many different ways, so you can have each time a different castle to play on. Second, the process of arranging the tiles in a castle and printing them is handled entirely through this extraordinary pdf product. That is: you can easily design your castle by adding the tiles you wish, where you wish on the battle grid with few mouse clicks. Once you have on screen the desired layout you can hit a button and your printer will print only the tiles you need for that layout; awesome. Moreover, if your castle is too complex you can even print a single sheet with the position of each tile on the battle grid. 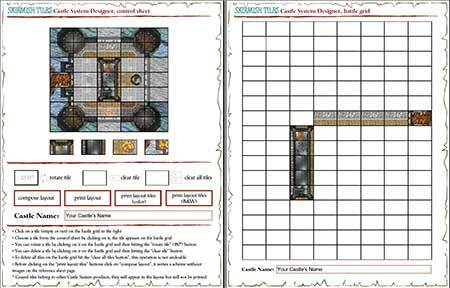 With the castle system designer utility you can compose a castle up to 5,3 x 6,6 feet! With this accessory you can build the ground level of a whole castle. 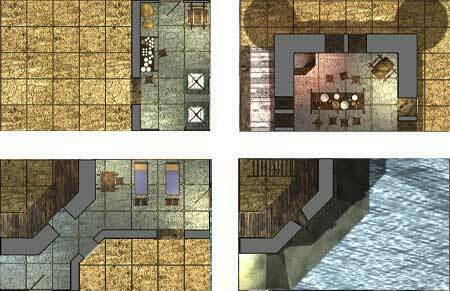 The Castle System series allows you to build a castle from the upper level to the ground floor. On the game table you can mix the various level of the castle allowing your miniatures to go “up” and “down” simply by substituting a tile with the matching tile on the other level. You can use the castle even for your RPGs, if you desire it could be the keep infested by goblins or the stronghold of a king, your imagination is the limit. This product contains 29 gorgeous tiles.